Captain Falcon using Knee Smash, his forward aerial attack, in Brawl. Jigglypuff's forward aerial attack in Melee. A forward aerial (前空中攻撃, Front/Forward midair attack; commonly abbreviated as Fair or f-air, and referred to as AttackAirF in Melee's Debug Menu and internal Brawl files) is an aerial attack that is performed in midair by pressing the attack button and tilting the Control Stick in the direction the character is facing. Its official term varies between titles, where it is known as a front midair attack in Melee, and a front air attack in Brawl and Smash 4. Forward aerials are usually not as strong as back aerials, though they have larger hitboxes most of the time, making them useful for edgeguarding. 1 List of forward aerials in Super Smash Bros. List of forward aerials in Super Smash Bros.
Captain Falcon Does two kicks. Would become Falcon's neutral aerial in future Smash Bros. iterations. First hit combos into up smash. 2nd hit has enough shield stun to forward throw out of it. 22% if both hits connect. Kirby Does a drill kick in front of him. A very useful combo move. Down aerial→up tilt→short hop→forward aerial→forward smash is one of Kirby's staple combos. 20% if all hits connect. Link Swings his sword in front of him. Link's strongest aerial in terms of knockback. His main combo ender outside of Spin Attack and forward smash. 20% if both hits connect. Pikachu Thrusts its head forward, doing electric damage. Would be a very useful combo move if it was more difficult to DI out of drills. Combos into up smash and all other aerial attacks. Not as heavily disjointed as Pikachu's other aerials. 21% if all hits connect. Samus Bursts out fire out of her arm gun. A useful combo move. It has high damage and is good at breaking down shields. Combos into down aerial. 20% if all hits connect. Captain Falcon The Knee Smash. Very powerful when sweetspotted. 18% when sweetspotted, 5-6% when sourspotted. Dr. Mario Known as "The Kobe". Identical in animation to Mario's but instead of producing a meteor smash, it is a strong launcher. Good for KOing. 17% sweetspotted, 16% sourspotted. Falco Similar to Fox. Five kicks in front. 27% if all hits connect. Fox Kicks forward five times. 17% if all hits connect. Ice Climbers Swings their hammer down. Meteor smashes if timed well. 10% both, up to 20%. Kirby Kicks forward three times. 16% if all hits connect. Link Horizontally spins twice while slashing with his sword. 13% first hit, 7% second hit. Mr. Game & Watch Swings a box forwards. 16% first few frames, 6% later frames. Ness Shoots multiple PSI shots out of his hands. 15% if all hits connect. Pichu Similar to Pikachu. Spins forward emitting sparks. 7% damage if all hits connect. Pichu will do 4% damage to itself when using this move. Pikachu Twirls forward while emitting sparks. 8% if all hits connect. Samus Shoots with her cannon in an arc in front of herself. 23% if all hits connect. Zelda The "Lightning Kick". Zelda kicks forward. Powerful if sweetspotted. 20% sweetspotted, 9% sourspotted. Rosalina & Luma Rosalina: Backflips in the air, creating a miniature galaxy at her feet. Deals multiple hits. From Melee onwards, Captain Falcon's forward aerial is the famous Knee Smash, which has very high KO potential if sweetspotted. It is considered more useful in Melee than in Brawl and SSB4, due to the former game possessing the ability to L-cancel and more favorable sweetspot placements and timings for the move. Snake's forward aerial is the most powerful forward aerial meteor smash in Brawl. Zelda's forward aerial is known as the Lightning Kick, and is a powerful finisher at high percents when sweetspotted. Marth's forward aerial is considered one of the best in Melee and Brawl, due to its fast startup and low ending lag, good range, its edgeguarding capabilities, and versatility. In SSB4, however, it was drastically nerfed by receiving more lag (starting, ending and landing) and a shorter hitbox duration, no longer being as safe to use upon landing or if untippered against shields. In Brawl, Falco's forward aerial is often considered the worst in the game, due to its poor range, high ending lag, and inferiority to similar attacks, such as Pikachu's and Sonic's. 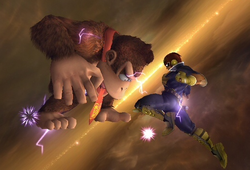 In SSB4, it was drastically buffed, given massive knockback with its final hit, reliably KOing offstage around 100% while not being particularly hard to land, making it arguably one of the best multi-hit forward aerials in the game. Jigglypuff's forward aerial is useful in performing the wall of pain, especially in Melee. Villager's forward aerial is a projectile, and as such, can be reflected or Pocketed. Sheik's forward aerial is one of her best moves for spacing and approaching, and overall one of the best aerials in the series, with an extremely early autocancel window (starting on frame 11) and long range enabling her to land it multiple times on opponents upon hitting them. In Melee, it is a devastating semi-spike with very high knockback for its speed. Conversely, its incredibly low knockback in SSB4 allows it to freely combo into itself and most of her other moves, including Bouncing Fish. Ness's forward aerial is known for being able to follow after a down throw and very easily comboing into itself. Donkey Kong's forward aerials launch targets at the Sakurai angle when hit in the earliest frames, but a clean hit will result in a meteor smash. The move also resembles his midair attack from Donkey Kong 64. Mario's forward aerial from Melee onwards meteor smashes opponents if landed with its clean hit, making it useful for edgeguarding and off-stage KOs. In SSB4, its clean hit was buffed with additional damage and knockback, and is easier to land as it lasts longer. Its utility has been greatly improved, as it is a 50-50 from down throw, and can be confirmed into from landing up aerials. Additionally, Mario's forward aerial has become the subject of the "Forward Aerial" meme thanks to Alpharad, who said "Forward aerial!" as he landed the clean hit of Mario's forward aerial during one SSB4 video on YouTube dedicated to him. This page was last edited on April 21, 2019, at 14:51.